Conference + 2 Concerts includes the Black Out Circuit Tour!!! Have a heart for the Urban Culture? Want to bridge the gap between the city and the church but not sure how to do that? Come to a power packed weekend full of teaching, training and equipping the urban leader for work of the ministry! We want to help you bridge the gap! 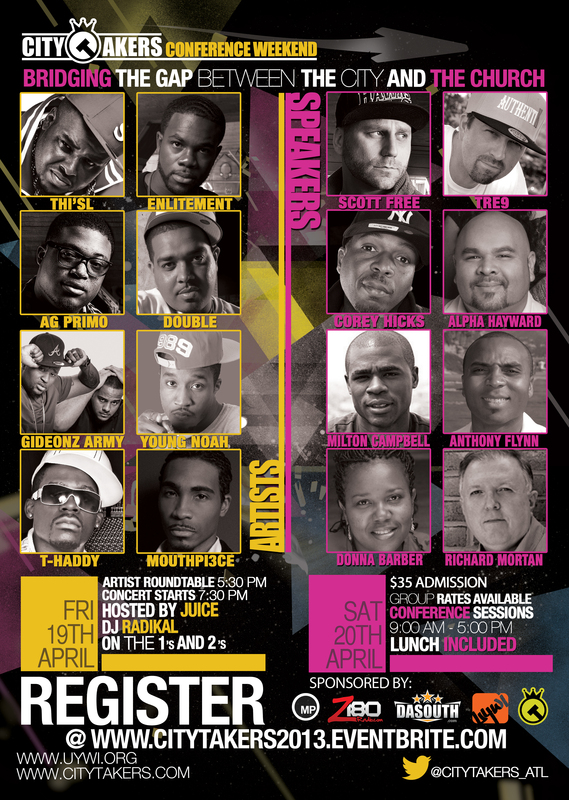 Artists: VROSE, Thisl, Enlitement, Shai Linne, AGprimo, Double, Bishop, Gideonz Army, Young Noah, Mouthpeice, Thaddy and more! Today’s school campus is truly a battleground. “For Such A Time As This…” you were called to journey beside and shield youth from the war that rages for them. UYWI’s new initiative, Thrive, will equip and resource Atlanta youth workers to reach local school campuses. This introductory training to Thrive, will begin the journey. It will equip you with the tools to cultivate teens in thriving, not just surviving, the battles for their souls. As you learn, you will experience the strength of a network of youth workers committed to shielding youth from attack, growing protective factors, and ultimately, increasing the overall well-being of youth on Atlanta school campuses! Oftentimes both kids and adults are unaware of the lifelong effects that an absent father has in the life a child. The emotional response of the fatherless can be linked to poverty, high school dropout rates, crime, drug use, and teenage pregnancy. The fatherless live a lifestyle living with a father they don’t see, while filling the empty space with painful outburst and pseudo-comfort realities. This Workshop will provide you insights for helping youth to discover their identity, pinpoint side effects that are gripping them from growth, and discover practical mentoring approaches to free their souls and not block their blessings. There is a huge leadership vacuum in urban America today, and it’s one of the biggest challenges facing youth leaders. What are you doing to identify and develop the emerging leaders around you? In this seminar you will hear a strategy for effectively developing young heroes, identify the five steps of delegation and empowerment, discover key criteria for young heroes to aspire tower, and gain practical insight for effectively mentoring and discipling urban youth. Join us as we examine ways of shifting our program philosophy, policy and practice in order to build organizations that inspire and develop community-minded leaders. Today’s youth have grown up in a different time and with changing cultural norms. The Christian view is being defined as intolerant, outdated and unacceptable. How do we as youth workers help out teens as they struggle with a sexual identity crisis? How do we minister to those students who accept the identity crisis as how they were born? This workshop will address what the research tells us, what the Word says, and how we can minister effectively with our teens. This workshop examines the simple, yet complicated task of making disciples in at risk-communities. Bobby “Tre9” Herring, an urban missionary, shares the paradigm shift he experienced and the practical strategies he implemented to infiltrate a Texas community with the gospel.